In addition to this topic, the following Network Controller documentation is available. Network Controller is a highly available and scalable server role, and provides one application programming interface (API) that allows Network Controller to communicate with the network, and a second API that allows you to communicate with Network Controller. You can deploy Network Controller in both domain and non-domain environments. In domain environments, Network Controller authenticates users and network devices by using Kerberos; in non-domain environments, you must deploy certificates for authentication. Network Controller communicates with network devices, services, and components by using the Southbound API. With the Southbound API, Network Controller can discover network devices, detect service configurations, and gather all of the information you need about the network. In addition, the Southbound API gives Network Controller a pathway to send information to the network infrastructure, such as configuration changes that you have made. The Network Controller Northbound API provides you with the ability to gather network information from Network Controller and use it to monitor and configure the network. The Network Controller Northbound API allows you to configure, monitor, troubleshoot, and deploy new devices on the network by using Windows PowerShell, the Representational State Transfer (REST) API, or a management application with a graphical user interface, such as System Center Virtual Machine Manager. The Network Controller Northbound API is implemented as a REST interface. You can manage your datacenter network with Network Controller by using management applications, such as System Center Virtual Machine Manager (SCVMM), and System Center Operations Manager (SCOM), because Network Controller allows you to configure, monitor, program, and troubleshoot the network infrastructure under its control. In the following illustration, an Administrator uses a Management Tool that interacts directly with Network Controller. Network Controller provides information about the network infrastructure, including both virtual and physical infrastructure, to the Management Tool, and makes configuration changes according to the Administrator’s actions when using the tool. If you are deploying Network Controller in a test lab environment, you can run the Network Controller server role on a single physical server (without using Hyper-V) or on a Hyper-V virtual machine (VM) that is installed on a Hyper-V host. For high availability in larger datacenters, you can deploy a cluster by using either three physical servers (without Hyper-V) or by using three VMs that are installed on three Hyper-V hosts. The following Network Controller features allow you to configure and manage virtual and physical network devices and services. For more information, see Datacenter Firewall Overview. This Network Controller feature allows you to enable multiple servers to host the same workload, providing high availability and scalability. For more information, see Software Load Balancing (SLB) for SDN. 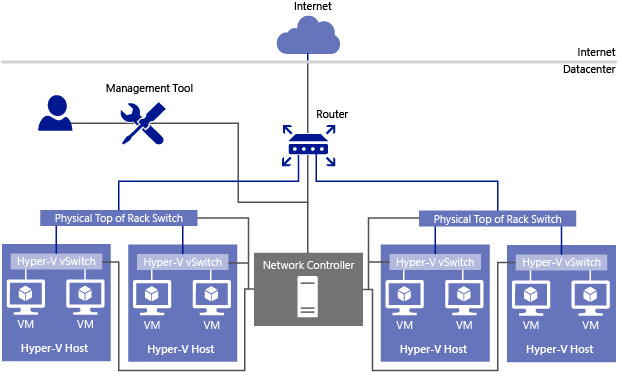 This Network Controller feature allows you to deploy and configure Hyper-V Network Virtualization, including the Hyper-V Virtual Switch and virtual network adapters on individual VMs, and to store and distribute virtual network policies. Network Controller supports both Network Virtualization Generic Routing Encapsulation (NVGRE) and Virtual Extensible Local Area Network (VXLAN). In System Center Virtual Machine Manager, RAS Gateway is named Windows Server Gateway. Add and remove gateway VMs from the cluster and specify the level of backup required. Site-to-site virtual private network (VPN) gateway connectivity between remote tenant networks and your datacenter using IPsec. Site-to-site VPN gateway connectivity between remote tenant networks and your datacenter using Generic Routing Encapsulation (GRE). Point-to-site VPN gateway connectivity so that your tenants’ administrators can access their resources on your datacenter from anywhere. Border Gateway Protocol (BGP) routing, which allows you to manage the routing of network traffic between your tenants’ VM networks and their remote sites. Network Controller is capable of dual-tunnel configuration of site-to-site VPN gateways and the automatic placement of tunnel end-points on separate gateways. In addition, Network Controller can load balance site-to-site and point-to-site VPN connections between gateway VMs, as well as logging configuration and state changes by using logging services. For more information on BGP, see Border Gateway Protocol (BGP). For more information on the RAS Gateway, see RAS Gateway for SDN.